GENEVA (AFP) — Surrounded by the Alps, graced by balmy winds and offering stunning views, the calm waters of Lake Geneva have enchanted poets and writers, and captured the eye of great artists. Today those bucolic surroundings are inspiring a generation of naval architects and boat builders, who have turned western Europe's biggest inland waterway into a laboratory for cutting-edge sailing technology destined for the high seas and the America's Cup. 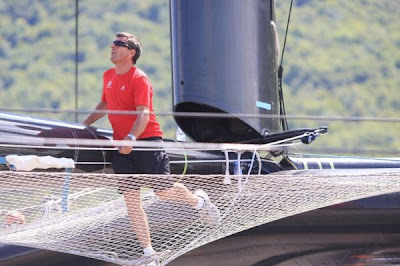 New developments for hulls, sails, rigging, or even whole boats that literally fly on the water have been hatched here over the past 15 years, and one of the first to benefit has been America's Cup holder Alinghi. 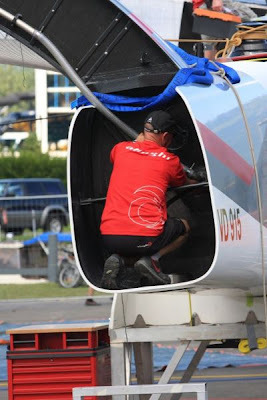 The Swiss team this week completed a huge, innovative, 90-foot (27-metre) catamaran to fight a duel with US challenger Oracle, resorting to a huge Russian helicopter to airlift it from the boatyard into the lake. It will be tested and developed there before it heads for the open seas. The lakeside area between the city of Geneva and Villeneuve is home to a dense network of naval designers, boat builders, sailors, cutting edge engineering expertise as well as sponsors ready to bankroll them. "You can take a lot of risks here by navigating on the high seas with boats that are very extreme, powerful and endowed with huge sails thanks to very high masts," said Sebastian Schmidt. 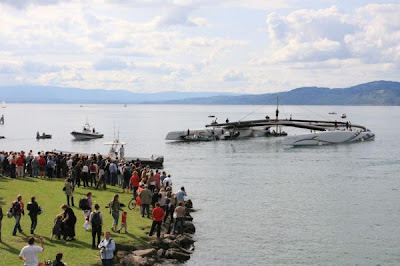 "If we capsize, we are never far away from the shore," quipped the naval architect. 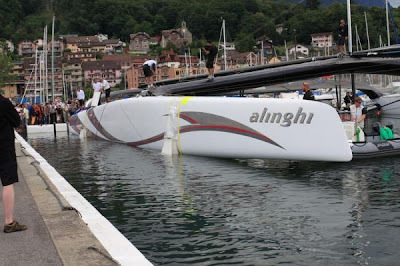 In 2004 he built some sailing jewels, among them the D35, a series of 35-feet catamarans capable of reaching 30 knots (about 50 kilometres/31 miles per hour).